Up early again today, but slept well last night, perhaps I am finally adjusting to my new time zone. We boarded our bus for a short 15 minute ride to visit Peles Castle. Unlike yesterday at Castle Bran where the crowds were huge, we almost had Peles to ourselves. Monday’s are the traditional day of closure for Museums, but Peles Castle opended today for our group. Peles Castle is set dramatically in the hills above Sinaia. Someone commented that this is what she expected Transylvania to look like and I agree. This 160 room palace, built in German enaissance style, was completed in 1914 for the first Hohenzollern king of Romania, Carol I. Unlike Bran Castle which is is over 700 years old, Peles is only 100 years of age. The castle was the king’s attempt to imitate the styles of his former homeland, ceating a Bavarian setting in the mountains of Romania. The castle’s sculpture terraces, art displays, and historic armories make it one of Romania’s most important and beautiful museums. The palace is ornately decorated, inside and out with intricate woodcarvings and paintings of scenes from Wagner’s operas. In many ways the Castle reminded me of the Biltmore House in Ashville, NC – not so much the exterior, but the interior. The library with incredible carvings throughout. The dining room which could expand for up to 36 people, here set for 24. The king had a private collection of armories covering several hundreds of years. There are over 4000 pieces in the collection. It is one of the largest in the world. This suit and horse armor weighs over 200 Kg. How did the horse carry it? There are dozens and dozens of statues on the grounds. I especially like this one because it reminds me of Daisy, our dog. 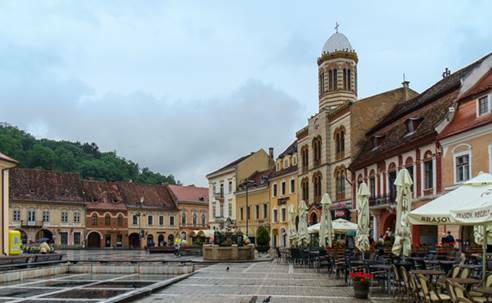 We then traveled to the city of Brasov, a fascinating city continuously settled since the Bronze Age. It has been enriched and influenced by people of many heritages – the Romans, the Saxons, and the Hungarians among them – as well as by the traders from all over Europe and beyond who arrived in this long thriving economic center. 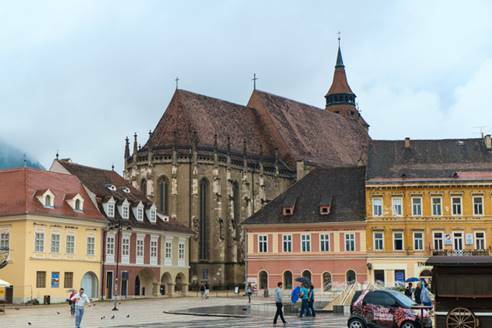 It is near the geographic center of Romania and is the largest city in the Transylvania region. The square in the Old City. Here are Alex and Stephon, enjoying a coffee and catching up on their work while waiting for us. The “Black Church”, built between 1384 and 1477, it is the largest Gothic church in Romania and one of Eastern Europe’s finest. Unfortunately, being a Monday the church was closed to visitors. 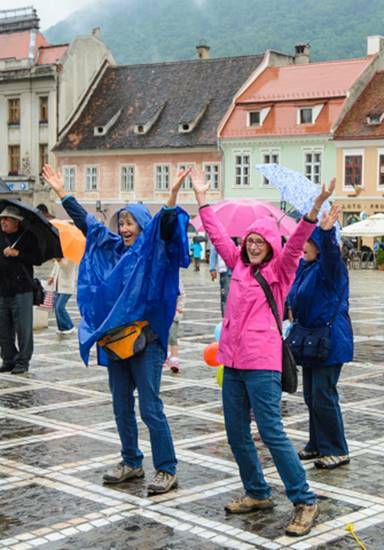 We really enjoyed visiting Brasov, despite the rain. The city was beautiful even wet. We enjoyed just walking the streets and stopping for a pastry and coffee. Back in Sinaia at about 4:00 PM, I worked on this blog and downloaded photos until 6:30 when we met Janet and Carl to go to dinner. David and Li elected to do an optional tour to The Azuga Wine Cellars which included dinner. We went to the Irish House and Janet and I had a traditional Romanian dish called Samalia which is cabbage stuffed with meat and spices and served with a grits like dish and a type of sauerkraut. I also had a platter of grilled mushrooms. It was wonderful. Kay had grilled trout and potatoes along with a large vegetable salad. We both had beers and the bill with tip was just over $30.00. Carl had spaghetti which he said was also very good. Afterwards we walked down the street to a coffee shop where I had a wonderful cheesecake with a baked pastry crust and espresso. Kay and Janet had a local type of ice-cream and Carl had some chocolate cake. It was a wonderful finish to a good day. As I finish this, I must finish my packing. Our luggage must be outside the door at 7;00 AM, and we leave at 9:00 to go back to Bucharest for lunch and then on to Constanta to board our river boat at 5:00PM. I have enjoyed reading the blog. Looks and sounds like you are having a great time. Sooo much to see. Take good care.